Opponents of the Transatlantic Trade and Investment Partnership (TTIP) see their chances of victory increasing. Local authorities are now also increasingly taking a strong position against supranational structures that negotiate opaque trade deals.Recent declarations by the two Austrian presidential contenders ensuring they would block TTIP , Hollande’s declarations claiming he would not approve TTIP at any cost and the Polish Agriculture minister rejecting the TTIP provisions about food safety rulesrevealed in the leaks published by Greenpeace Netherlands, have placed the EU Commission and the EU Chamber of Commerce on the defensive. They have reason to be worried, support for TTIP is plunging in the US and Germany – from more than 50% in 2014 to less than 20% now – to the extent that US Consulting firms working for Pro-TTIP groups call for coordinated actions to win the public debate and “control the news cycle”. Indeed the news now is that TTIP is falling apart. The German newspaper Der Spiegel recognises that “an unprecedented protest movement” is threatening to collapse TTIP. Both Der Spiegel and the Guardian praise the professionalism of the anti-TTIP activists, many of them applying the lessons from two decades of fighting the trade regime built around the IMF, the World Bank and the WTO. This occurs in a context of organisational practices inspired by the occupation of the public space and the use of communication technologies. The latest example occurred last weekend with the success of the French movement NuitDebout calling for a self-organised #WorldDebout. In the struggle against the global trade regime the political trenches are different than a decade ago, and this explains how the anti-TTIP movement has expanded beyond the anti-neoliberal and anti-corporate led trade circles. The definite battle line has been drawn around the defence of sovereignty and the “right to decide”. This was evident in the first gathering of Free-TTIP cities convened in Barcelona last month. The host of the meeting, Barcelona City Council representative Gerardo Pisarello, framed TTIP in terms of loss of sovereignty and democracy, “We the cities want to have a say in the politics that will affect the lives of our citizens”, stating that with this treaty many social policies “will be effectively blocked”. 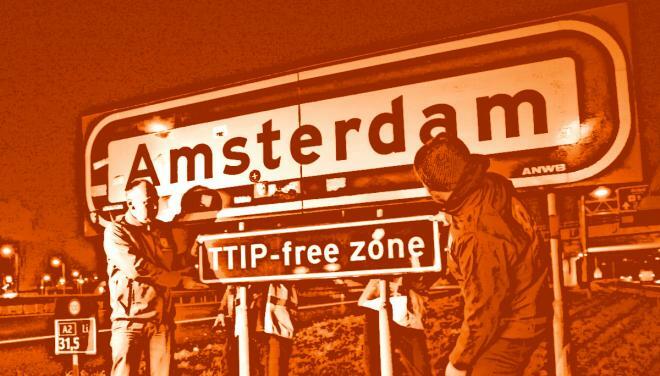 To date more than 1800 European cities and regions have declared themselves TTIP- Free zones. The defence of democracy at the local level relates to the flourishing of a new economy, the alternatives emerging before the incapacity of both the state and the market – the key actors of the last century – to solve the daily needs of a growing number of people. This new economy takes many forms and names and by no coincidence Barcelona is one of the places where we find many examples of the commons collaborative economy practices. As rightly stated in Barcelona by Attac Austria President and key activist of the anti-TTIP European Alliance Alexandra Strickner “We are not working only against Free Trade Agreements as in the past; there is a fight for alternatives”. For the municipalities represented in Barcelona their capacity to promote Public Alternatives was an issue of major concern. Public procurement has become a key tool to expand and consolidate local alternatives to the current economic system based on global value chains dependent on fossil fuels and low labour standards. The Barcelona declaration states “We are deeply concerned that these treaties will put our capacity to legislate and use public funds (including public procurement) at risk, severely damaging our task to aid people in basic issues such as: housing, health, environment, social services, education, local economic development or food safety.” In other words, trade agreements can block and reverse global trends such as the remunicipalisation of water services or other services. The Barcelona conference confirmed that broadly accepted global governance tools like the principle of subsidiarity and useful regulations like the Directive 2014/24/UE about public procurement are being dismantled with the new generation of trade agreements. What are the next steps? The broad coalition of social movements, civil society organisations and more combative trade unions should consolidate the alliance with the network of free-TTIP cities. Now that some EU governments are openly questioning TTIP the European coalition is already focusing on CETA. Dubbed the Canadian TTIP, CETA is due to be ratified this autumn as a “back door” for US multinationals with a base in Canada aiming to enter the so far protected European markets. An “autumn of dissent” is already being prepared with different mobilisations against the various Free Trade Agreements and the transnational corporations that promote them. This is a good opportunity to consolidate the engagement of the cities in the mobilisations, which will require imagination and political commitment. If CETA is defeated it would be a fatal blow to TTIP, however there are more battles on the horizon, such as the TiSA (Trade in Services Agreement). These battles against various acronym-lade trade agreements is simply evidence of a broader reality; the corporate capture of national and supranational institutions, which forces civil society to be on the defensive. However, the Barcelona meeting demonstrated that municipal governments united in the struggle to defend democracy and sovereignty is an effective strategy that can protect and promote the blossoming of post-capitalist spaces. Local governments are becoming a strategic actor protecting citizens’ rights where nation-states have failed. And commitments are being made. Grenoble, one of the first cities to remunicipalise water services in France, took up the torch and will host the next TTIP, CETA and TiSA-Free Zones gathering. These transformative cities should not become islands in a sea of neoliberal globalisation, but spaces to develop a political practice that protects and nurtures the local while ensuring international solidarity and cooperation.